Mexico has an elaborate system of “budgeting for results,” of which budget programs are an important part. Results-based budgeting is a form of performance budgeting that attempts to link allocations to the achievement of specific results, such as outputs and outcomes of government services. While program budgeting is not new in Mexico, the last decade has seen efforts to refine and consolidate the number of budget programs, and to enhance the quality and logic of performance indicators and targets. Mexico’s health budget has 31 programs, which is more than any other country included in our recent study on program budgeting in the health sector in low- and middle-income countries. 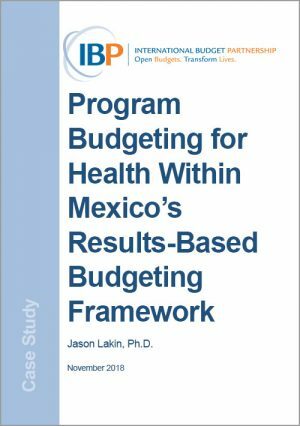 This case study examines Mexico’s approach to program budgeting in the health sector – in particular the advantages and disadvantages of having a large number of programs.